Big Ten logo in Purdue's colors. The Purdue Boilermakers are the official intercollegiate athletics teams representing Purdue University, located in West Lafayette, Indiana. As is common with athletic nicknames, the Boilermakers nickname is also used as colloquial designation of Purdue's students and alumni at large. The nickname is often shortened to "Boilers" by fans. Purdue is one of the few college athletic programs that is not funded by student fees or subsidized by the university. In 1889, Purdue played Wabash College in Crawfordsville, Indiana, and won the game 18-4. Students from the college and citizens of Crawfordsville began calling the Purdue players "a great big burly gang of corn-huskers", "grangers", "pumpkin-shuckers", "railsplitters", "blacksmiths," "cornfield sailors", and "foundry hands". The Purdue students experienced hands-on education at the university, including the maintenance of a fully operational steam locomotive. Purdue defeated Wabash College again in 1891, 44–0. An account of the game in the Crawfordsville Daily Argus News of October 26, 1891 was headlined, "Slaughter of Innocents: Wabash Snowed Completely Under by the Burly Boiler Makers from Purdue". Purdue became known as the boilermakers the next year. Several of the local schools added to the boilermaker tradition by suggesting that Purdue was going up the Wabash River and hiring workers from the nearby Monon railroad yards to play football. Purdue's official mascot is a Locomotive, the Boilermaker Special. The Monon Railroad had its main locomotive shops in Lafayette, not far from campus. Purdue's athletic teams wear a combination of old-gold, black, and white, colors that have identified Purdue since 1887. In the early 1890s Purdue fielded dominating football teams. In 1891 Purdue went 4-0, outscoring opponents 192-0. In 1892 Purdue went 8-0, outscoring opponents 320-24. In 1893 Purdue went 5-2-1, outscoring opponents 334-144. In 1894 Purdue went 9-1, outscoring opponents 288-36. Over these four years, Purdue's combined record was 26-3-1, outscoring opponents 1134-204. Purdue beat in-state rival Indiana University 60-0, 68-0, 64-0, and 6-0 by an understandable forfeit. Purdue went 2-1 against Illinois, 2-1 Wisconsin, 3-0 against Chicago and split 2 games with Michigan. The Purdue Boilermakers competed as 'Independent' until 1889. In 1890, they joined the 'Indiana Intercollegiate Athletic Association' and, finally, the Big Ten Conference in 1896. The Purdue Boilermakers have been Big Ten Conference Champions in 1918, 1929, 1931, 1932, 1943, 1952, 1967 and 2000. However, they made their first appearance in the Rose Bowl - the "grand-daddy of them all" - with a 1966 second-place finish in the Big Ten; conference rules at that time prevented Michigan State from appearing in consecutive Rose Bowls. The Boilermakers, under NFL hall-of-famer Bob Griese defeated the University of Southern California Trojans 14-13 to win the 1967 Rose Bowl. When the Boilermakers shared the Big Ten title the following season, the consecutive-appearance rule kept them out of the 1968 Rose Bowl. Purdue did not return to the Rose Bowl until 2001, losing to the University of Washington Huskies 24-34. Purdue has traditionally been called the 'Cradle of Quarterbacks', having produced NFL stars Cecil Isbell, Dale Samuels, Bob DeMoss, NFL Hall of Famer and Super Bowl MVP Len Dawson, NFL Hall of Famer Bob Griese, Mike Phipps, Gary Danielson, Mark Herrmann, Scott Campbell, Jim Everett, Eric Hunter, Billy Dicken, Kyle Orton and Super Bowl MVP Drew Brees. Purdue QBs have thrown more touchdowns in the NFL than any other university, 1,311 at the end of the 2010 season. In 2011, there were three starting quarterbacks in the NFL from Purdue: Drew Brees of the New Orleans Saints, Kyle Orton of the Denver Broncos, and Curtis Painter of the Indianapolis Colts. The team is currently coached by Jeff Brohm. The Boilermaker men's and women's basketball teams have won more Big Ten Championships (regular season and tournament) than any other conference school, with 37 conference banners, including a league-leading 23 for the men’s team. Men’s former head coach Gene Keady coached his final season with the Boilermakers in the 2004–2005 season after 25 years with the Boilermakers. Coach Keady became Purdue's all-time-winningest coach on December 6, 1997. In his years at Purdue, Keady led the Boilermakers to a 512-270 record and a .655 winning percentage. The current coach of the Boilermaker men's basketball team is Matt Painter. A former player and Purdue Alum under Keady, Painter is now in his 11th season as the head coach and is currently third on the school's all-time wins list. The Purdue Boilermakers baseball team have been conference champions twice, in 1909 and 2012. In 1987, 2012 and 2018 they appeared in the NCAA tournament. The Purdue golf team inaugural season was in 1921. The team earned a national championship in 1961, and have been Big Ten champions twelve times. The team has had two NCAA individual champions: Fred Wampler in 1950 and Joe Campbell in 1955. The team has also earned 12 Big Ten championships through 2017. The Purdue Boilermaker wrestling team started in the 1913-1914 season. Placing as high as 2nd in the NCAA National Championships the team has placed in the NCAA tournament for over 25 years straight. The team is coached by Tony Ersland, who wrestled for the University of Iowa under legendary coach Dan Gable. He is assisted by Tyrel Todd, Kendric Maple, and Jake Sueflohn. The team competes in the Big Ten Conference. Purdue Wrestling practices in the Blake Wrestling Training Center and competes on campus in the Holloway Gymnasium (2,288). Women's College World Series appearance: 1972. † = Women's championships were not fully sanctioned with the Big Ten Conference until the 1981-1982 season. Purdue is home to both an English and Western riding program. Their English team specializes in Hunt Seat and is a member of the Intercollegiate Horse Show Association. The Purdue Equestrian team was founded in 1980 by Jerry Steinmetz, who coached the team until 2017. His daughter, Krista Steinmetz, became the coach in that year. The team has reached the Intercollegiate Horse Show Association (IHSA) Nationals twenty times, placing in the top 10 ten times. The team has a student-run Executive Board in which current Purdue students help run the club. Purdue gymnastics competes in National Association of Intercollegiate Gymnastics Clubs (NAIGC) with a 2nd place men's finish in both 2015 and 2016. In 2019, the team placed 1st in the modified NCAA division. Founded in 1970, Purdue plays college rugby in the Big Ten Universities conference against its traditional Big 10 rivals such as Indiana, and also plays in the annual Big 10 rugby sevens tournament each fall. Purdue men's rugby is led by head coach Mark Behrens, and Purdue women's rugby is led by head coach Lake Paul. Purdue has a successful men's volleyball program that competes in the National Collegiate Volleyball Federation (NCVF). Purdue won the Big Ten Championship tournament in 2014. The golf complex houses 2 distinct 18 hole courses, The Ackerman Hills Course and the Kampen Course. The golf complex also includes the Pete Dye Clubhouse, Tom Spurgeon Golf Training Center, short game areas and a driving range. The Kampen Course hosted the Women's NCAA golf championship in 2003 and the Men's NCAA championship in 2008. The facility is home to 12 outdoor and 6 indoor tennis courts. In addition to holding Belin Court as a dedicated surface for Volleyball and primary competition arena for Wrestling, the building is also the location of the Brees Academic Performance Center, home to several other athletic facilities. The Athletic Ticket Office, Jane P. Beering Academic Learning Center, and large weightroom are also inside the Brees building. Additionally, the football game day locker rooms are located in Brees. Originally home to the Boilermaker basketball team and the Boilermaker Swimming Team, the fieldhouse now is used solely by the Men's and Women's Track teams for indoor competitions. The pool has been filled in to make way for a training center for the wrestling team. Mollenkopf Athletic Center – An indoor training facility used primarily for the football team. It includes a full practice football field, extensive weight room, and offices for the football program. Also housed in Mollenkopf is the Purdue Football Hall of Glory. Mollenkopf was expanded in 2017 with the addition of the Football Performance Complex. The expansion includes new team meeting and film rooms, new coach's offices, a state of the art weight room and new locker room. The Aquatic center was an addition to the Purdue Recreational Services Center in 2001. The aquatic center includes an Olympic sized pool, diving well, dressing facilities, hot tub, and spectator areas. Purdue's main rivals are the Indiana University Hoosiers, against whom the Purdue football team plays annually for the Old Oaken Bucket. The Purdue football team also competes against the Fighting Irish from the University of Notre Dame for the Shillelagh Trophy and the University of Illinois Fighting Illini for the Purdue Cannon trophy. The Purdue All-American Marching Band perform Hail Purdue at the 2008 Purdue-Indiana football game. Purdue's Band was formed in 1886 and named the 'All-American' Marching Band in 1935. The AAMB has made 99 consecutive appearances as the host band for the Indianapolis 500. The AAMB performs at all home football games where they play the university fight songs, Hail Purdue! being the most famous, and other songs ranging from jazz to rock. Gold and Black Sound (GABS) is the athletic band for women's basketball. They are among the largest pep bands in the country, with more than 250 members. Boiler Brass is the athletic band for men's basketball. Boiler Box Band is the athletic band for the volleyball team. 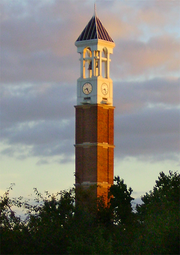 The Boilermaker Special has been the official mascot of Purdue since the 1930s. The 'Specials' are Victorian era locomotives. The Boilermaker Special I made its debut on the first day of classes in 1940. Alumni, faculty and students have since then raised funds to replace the Special as it has worn out. The Boilermaker Special V was unveiled in 1993 at the Purdue–Notre Dame game. In 1940, the then owners of the University Bookstore, Doc Epple and Red Sammons hired local artist Art Evans to draw a boilermaker to use as an advertising icon for the bookstore. A modernized version is still used in that capacity at University Bookstore. In 1944, the editors of the university's Debris yearbook sought, and obtained, permission from University Bookstore to use Purdue Pete on the cover of the 1944 edition of the Debris yearbook. When asked the name of the boilermaker depicted in the advertising drawing, Epple coined the name "Pete". Since 1956, Purdue Pete has been a regular at Purdue games - usually wearing the head with a football or basketball uniform and portrayed by one of four selected members of the spirit squad. Originally, the head costume was made of chicken wire and papier-mâché, but in later years has been made of fiberglass for better durability during rainy football games. Bradley-Bourbonnais Community High School in north-east Illinois also uses a mascot similar to Pete called "Bruno the Boilermaker". The Boilermaker is a statue located adjacent to Ross Ade Stadium that was dedicated on Friday, November 4, 2005, as a monument commemorating the "indomitable spirit of the boilermaker". ^ Purdue Athletics Brand Standards (PDF). June 20, 2018. Retrieved September 10, 2018. ^ "Purdue athletics maintains stance on not paying athletes". Purdue Exponent. Purdue University. Retrieved December 13, 2011. ^ "CSM0810 Search and Report". B2.caspio.com. Retrieved 2015-08-30. ^ a b "Why are Purdue students and alumni called Boilermakers?". The International Brotherhood of Boilermakers, Iron Ship Builders, Blacksmiths, Forgers and Helpers. Retrieved October 8, 2017. ^ "What is a Boilermaker?". Purdue Sports. Retrieved October 8, 2017. ^ "Purdue Alumni Pro Stats". Pro-Football-Reference.com. Retrieved 2015-08-30. ^ "Championship History". NCAA. Retrieved October 9, 2017. ^ McFadden, George (July 2, 1950). "Purdue's Fred Wampler Captures NCAA Golf Tournament". Albuquerque Journal. p. 12. Retrieved October 9, 2017 – via Newspapers.com. ^ "Purdue's Joe Campbell Wins NCAA Golf Crown". Logansport Pharos-Tribune. June 27, 1955. p. 15. Retrieved October 9, 2017 – via Newspapers.com. ^ "NCAA Division I Men's Basketball – NCAA Division I Champions". Rauzulu's Street. 2004. Retrieved June 17, 2014. ^ ESPN, ed. (2009). ESPN College Basketball Encyclopedia: The Complete History of the Men's Game. New York, NY: ESPN Books. p. 542. ISBN 978-0-345-51392-2. ^ "Big Ten Releases 2012 Baseball Tournament Bracket". Big Ten. May 19, 2012. Retrieved October 8, 2017. ^ "Welcome to Purdue University's IHSA Hunt Seat Team!". Retrieved January 15, 2018. ^ "The Executive Board". Retrieved January 15, 2018. ^ "Dr. Lake Paul - Biophysical, Physical Bioinorganic & Bionanotechnology Seminar 09/23/2013?> - Department of Physics - Purdue University, West Lafayette, Indiana". Physics.purdue.edu. 2013-09-23. Retrieved 2015-08-30. ^ "Purdue Men's Club Volleyball". Purduemvb.wix.com. Retrieved 2015-08-30. ^ "Football Performance Complex". Retrieved August 27, 2017. ^ "A History of Purdue Pete - Engineering Computer Network - Purdue University". Engineering.purdue.edu. 2003-12-23. Retrieved 2015-08-30.